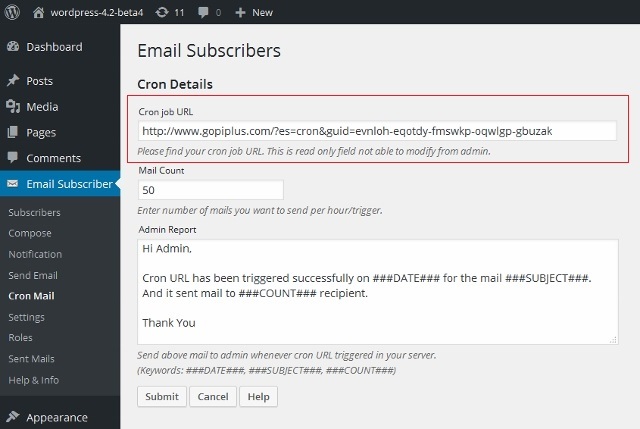 How to schedule auto mails (Cron mails) in Email subscribers wordpress plugin? This plugin provide option to schedule newsletter/Notification mail. In Send Mail and Notification Setting page we have option to set Mail Type. If you want to schedule mail you can select Send mail via cron job option. If you selected this option, plugin will not send a mail immediately instead it will send mail whenever your CRON URL is triggered. You can easily trigger this URL automatically using your hosting server. If you have Plesk control panel click here, If you have cPanel click here. Contact your hosting support If you don’t have control panel login. There is a text box called Mail Count available in the Cron Mail admin page. 50 is a default value in this text box. It means it will send 50 mails whenever cron url is triggered. Also plugin will send one report mail to admin whenever cron url is triggered. 1. Contact your hosting and find How many mails you can send per hour? If they said you can send 50 mails, Set 50 in Mail Count text box. 2. Login to your server and schedule the cron job. You can schedule cron once every hour. How to schedule auto emails (cron job) for Email subscribers wordpress plugin in cPanel? How to schedule auto emails (cron job) for Email subscribers wordpress plugin in Parallels Plesk? Hosting doesn’t support cron jobs? If you don’t have cPanel or Plesk account and your hosting doesn’t support cron jobs. Don’t worry, Lots of vendors available for this action. I recommend EasyCron! The easiest way to configure advanced scheduled tasks. Where to find my cron URL? 1. To find your cron URL. Go to Cron Mail menu in your plugin admin. In this page you can easily copy your URL from the Cron Job URL text box. Plugin will send one report mail to admin whenever the cron job is triggered successfully. Check the above screen, there is a option available to change the mail content.